Recombinant monoclonal antibody to desmoglein-3. Manufactured using AbAb’s Recombinant Platform with variable regions (i.e. specificity) from the EBV transformed human B cell clone PVB28. 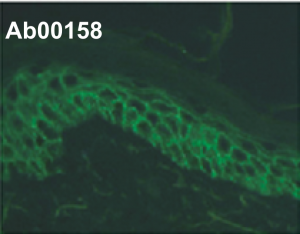 Specificity: This antibody specifically recognizes a conformational epitope in the EC2 domain of human desmoglein-3 (DSG	This antibody was isolated as a human IgG4 from a patient with mucocutaneous pemphigus vulgaris and uses the VH4-39*07, D6-13*01, JH4*02, VL3-15*01and JL2*01. This antibody has in vitro and in vivo pathogenic activity, as assessed in a keratinocyte dissociation assay and by the formation of microscopic blisters in newborn mice. This antibody crossreacts with murine DSG-3. Note on publication: Describes the isolation and analysis of a panel of human antibodies from patients - inc data on ELISA, IF and in vitro and in vivo pathogenic activity assays. Cryosection of human skin stained with biotinylated DSG3-specific monoclonal antibody Ab00158. (A) Cryosections of human skin stained with biotinylated DSG3-specific monoclonal antibodies (Ab00153, Ab00155, Ab00158 and Ab00156). 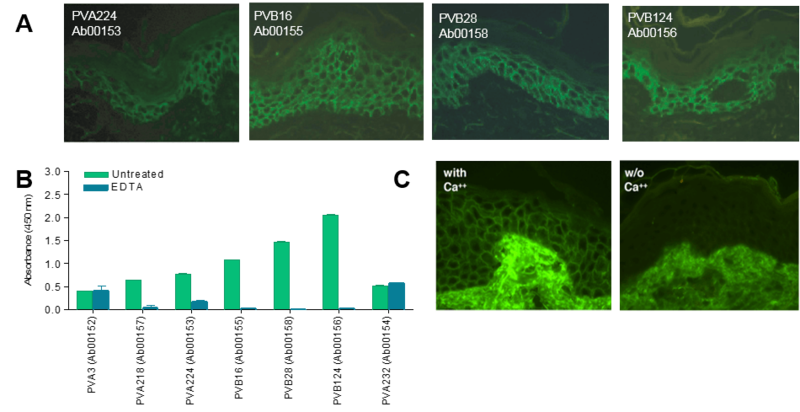 (B) Staining of human epidermis with biotinylated PVB28 (Ab00158) in the presence (with) or absence (w/o) of Ca2+. (C) Binding of a panel of pemphigus auto-antibodies to DSG3-coated ELISA plates in the presence or absence of EDTA.